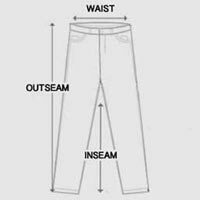 Mens Acid Wash Jeans by LKK Jeans. These mens acid wash jeans are the triple threat of men’s denim. Featuring dark blue denim treated with a yellow acid wash. Constructed with front and back pockets, hidden three-button fly, and belt loops. Mens acid wash jeans designed with distressed markings and small rips along front. Made from premium cotton blend with slight stretch to comfortably fit your figure. Jeans treated with vintage wash for denim that never goes out of style. These mens acid wash jeans are the perfect match for any casual ensemble. Model is wearing size 36. For accurate measurements, check the table below.